A local veteran is facing a bill of more than $500 for his children's lunch money despite qualifying for free lunch. SHELBYVILLE, Ind. -- A local veteran facing a collection agency over unpaid school lunches for his three children is now receiving assistance from the Indiana Department of Veteran Affairs thanks to a Call 6 investigation. George White, who enlisted in the U.S. Army when he was 17, served in Saudi Arabia to support soldiers in Operation Desert Storm. After an honorable discharge with three Bronze Stars, White suffered multiple heart attacks and strokes, and now depends on a monthly Veterans Affairs check and food stamps to get by. Because of his financial situation, White says his children have always qualified for free lunches. But now a collection agency is seeking repayment of $562 on behalf of Shelbyville Central Schools. The amount stems from unpaid school lunches for White's three children, who attend schools in the district. White says he is unable to pay the bill. "I wish I had the money to pay," White said. "I don't have the money." The school district declined to comment on White's case, citing federal privacy rules. But the district does say it has a no "food shame" policy, meaning children are offered a full meal even if they don't have enough money for lunch. 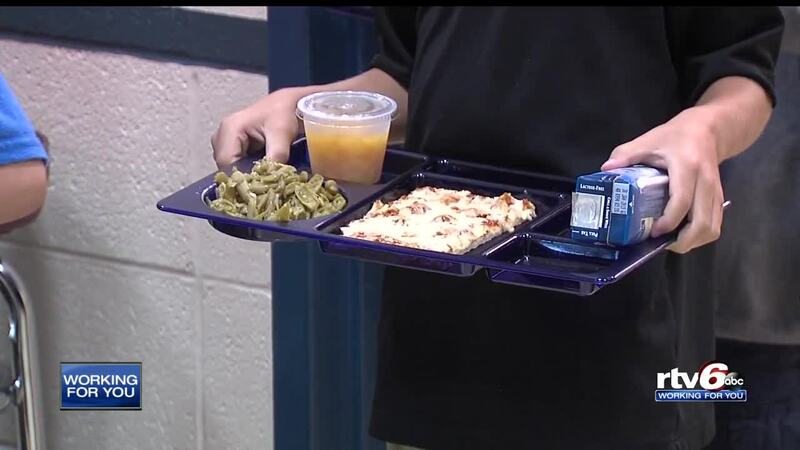 According to Shelbyville schools, this policy has made it difficult to get parents to sign up for free or reduced lunch and caused more than $200,000 in debt. Federal law states the debt must be paid by parents or the school system. White says Shelbyville is a great school system for his kids, and the superintendent is a "good guy," but he simply can't pay the bill. When asked what he'd like to be done about the debt, White answered, "Get rid of it." Superintendent Dr. David A. Adams said he doesn't have the authority to erase a family's debt and that payment plans are offered to those who are behind. According to the Indiana Department of Education, 48 percent -- or nearly 548,000 students -- are on the free or reduced lunch program. The IDOE is aware that districts across Indiana are experiencing issues with bad debt, but does not collect specific data since the food program is run by the U.S. Department of Agriculture. IDOE spokesperson Adam Baker says parents should reach out to their local districts to appeal or work out any lunch debt concerns. As for White, he is now receiving help from the Indiana Department of Veteran Affairs. Call 6 Investigates reached out to the executive offices of the VA Medical Center in Indianapolis to request assistance for White. The VA moved quickly and connected White to a social worker and provided resources to assist his family. While they can't pay for a bill in collections, the VA does have a Military Relief Fund set up to help families with current bills. The goal is to help White with his current bills to free up cash so he can pay off the lunch debt sent to collections. The VA hospital also connected White with resources to reduce their cable bill, which is needed for the kids' school assignments. The low-cost wireless home internet service is open to qualifying homes who have at least one resident who receives food stamps. Q: Do families in similar circumstance have a way to appeal bad lunch debt before it goes to collections? A: Lunch debt occurs at the local level with local districts and schools. For this reason, we encourage parents to reach out to their local districts to appeal or work out all lunch debt concerns. Please note, the food service cannot forgive the debt but the school corporation could pay the debt for the household if they felt they were in error. Q: How many school districts are dealing with bad lunch debt and for how much? A: IDOE does not collect this data. However, is since July 2017 USDA has required school corporations who participate in School Nutrition Programs to have a written policy on unpaid meal charges and they are required to send this policy to all households within the school corporation. Q: What is IDOE doing to assist districts to be in compliance? A: We are constantly providing guidance as well as resources to local districts. Additionally, we have local coordinators in each region who will visit schools for any one-on-one assistance. Q: What more can be done to encourage families to apply for free and reduced meals? A: We encourage schools to be constant in making parents aware of the free or reduced lunch program. As well, families who have direct certification automatically receive free or reduced meals. There are essentially three ways a household can be approved for meal benefits. One way is through an application that uses either household income or allows the household to put a food stamp or TANF number on the app and submit it. Schools review the application and award or deny benefits based on the information on the application. There are specific procedures for notifying the household of approval or denial of benefits. The second is called Direct Certification. All school are required to conduct Direct Certification a minimum of 3 times during a school year, one of those being before they send out information on how to fill out an application. We advise food service staff to do this once a month and to always conduct a Direct Certification when new students enroll in the school corporation. To conduct this process, the school staff use the STN database. The STN is magically programmed to match student data with Food Stamp/TANF and in SOME cases Medicaid data (not all Medicaid is eligible for free or reduced meals) to give the schools immediate matches to their records. The school then notifies the household their child/children are eligible to receive free (or in some cases reduced) meals based on Direct Certification. The third way is by the student being identified as runaway, homeless, or migrant. This is done by the homeless liaison at the local school corporation.